Final Summer Camp Weekly Special Event! Free T-shirt & Lunch Bag for Each Registered Child! Go back to school with some Pacific West Gymnastics swag. One Pacific West Gymnastics t-shirt and lunch bag will be given to each attendee. For more than 20 years the Happy Birds have been performing educational and fun classroom presentations, school assemblies, preschools and camps. Do a giant on the bars? This performance is fast paced, upbeat with over 25 amazing tricks! 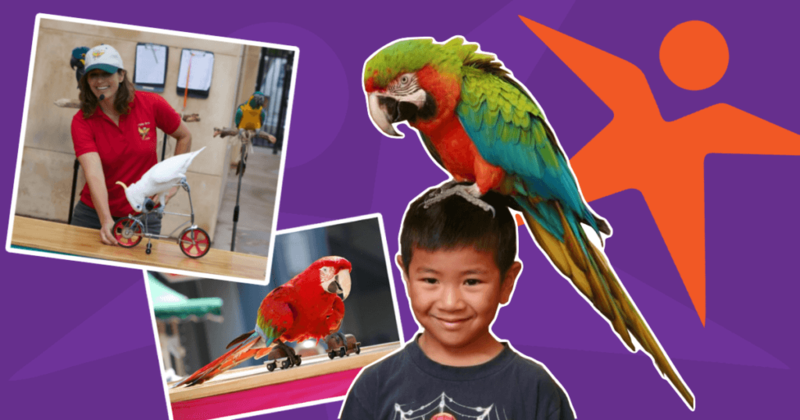 Register to see the Happy Bird Show! Registration is available online using our Studio Director site. If you’re new to Pacific West Gymnastics & Camp Pac West, you may create an account and select The Bird Show event on the calendar to reserve your spot and pay online. Otherwise, general admission is first come first server at the door. Camp Pac West is Pacific West Gymnastics Summer Camp Program–serving the entire Bay Area. Our camps are filled with high energy, structured activities for your active kids and incorporates gymnastics, arts and crafts, group games, fun and friends every single week! With flexible scheduling and morning, afternoon or full day options, we make it easy for your children to experience the fun. Come in for a day or the entire week, and we promise it’ll always be a new experience! ← Updated for August: Free Trial Class Plus Free T-Shirt!